The View posted Part II of this story on the morning of March 21. That afternoon, for the first time since January 7, there was no visible police presence on the 3700 block of South State Street. We later learned that 2nd District personnel had been deployed downtown because of anti-war protests. It is thus hard to judge the impact, if any, of the View report. In any case, there have been no police cars stationed at fixed locations on South State Street since March 21. The State Street Coverage Initiative has, it appears, been suspended for the time being, but the questions it raised remain open. Why was this police policy undertaken? Why are the residents of South State Street and other people not being allowed to meet or talk on the 3500 to 3700 blocks of South State? How do you justify this allocation of police manpower, in light of pressing needs in this community and elsewhere in the City? The Superintendent flatly denied that the State Street Coverage Initiative was a matter of policy. I made a brief statement to the Board in which I described what I had observed on State Street—citizens arrested for being on the street, told they could not await at the bus stop, given jaywalking tickets, and so on. What, I asked, was the rationale for the massive allocation of police manpower to one-and-a-half blocks of State Street? Superintendent Hillard again stated that the State Street Coverage Initiative “is not a policy of the Chicago Police Department.” He went on to say, “People should be able to patronize the library. People should be able to stand on the street and catch the CTA bus, if they need transportation. People should be able to go to the stores.” Again, he emphasized “drug dealers and gangbangers along the State Street corridor” as the rationale for the increased police presence. Following the Police Board hearing, Ms. McCullough received a response to her letter to Superintendent Hillard. Dated March 12, it was signed by Commander Marienne Perry of the 2nd District. 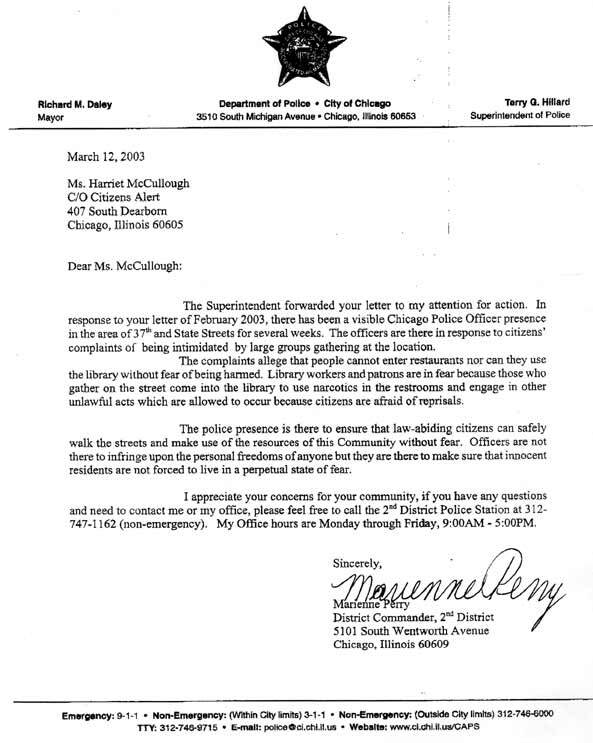 In response to your letter of February 2003, there has been a visible Chicago Police Officer presence in the area of 37th and State Streets for several weeks. The officers are there in response to citizens’ complaints of being intimidated by large groups gathering at the location. Her phrasing suggests that the State Street operation began in mid-February. In fact, it began, with great intensity, on January 7 and was sustained without lapse until mid-March. The complaints allege that people cannot enter restaurants nor can they use the library without fear of being harmed. Library workers and patrons are in fear because those who gather on the street come into the library to use narcotics in the restrooms and engage in other unlawful acts which are allowed to occur because citizens are afraid of reprisals. The police presence is there to ensure that law-abiding citizens can safely walk the streets and make use of the resources of this Community without fear. Officers are not there to infringe upon the personal freedoms of anyone but they are there to make sure that innocent residents are not forced to live in a perpetual state of fear. Superintendent Hillard repeatedly stated that the State Street Coverage Initiative was not a police policy. This statement would seem to be contradicted not only by police practices sustained over a period of two-and-a-half months but by internal CPD documents—the Chief of Patrol’s January 9 order and Commander Perry’s memo to personnel under her command. 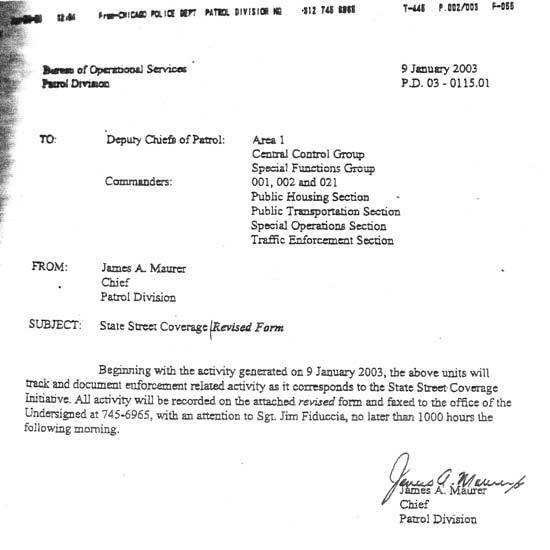 In order to resolve this apparent contradiction, The View has submitted a request to the CPD under the Freedom of Information Act for any other documents pertaining to the State Street operation—above all, the initial order to which the Chief of Patrol’s January 9 order on reporting procedures is an addendum. Commander Perry’s letter states that the heightened police presence on South State Street was in response to citizens’ complaints. There is no question that the librarians at the Chicago Bee Branch Public Library, merchants on State Street, and Stateway Gardens management have made occasional complaints to the police. 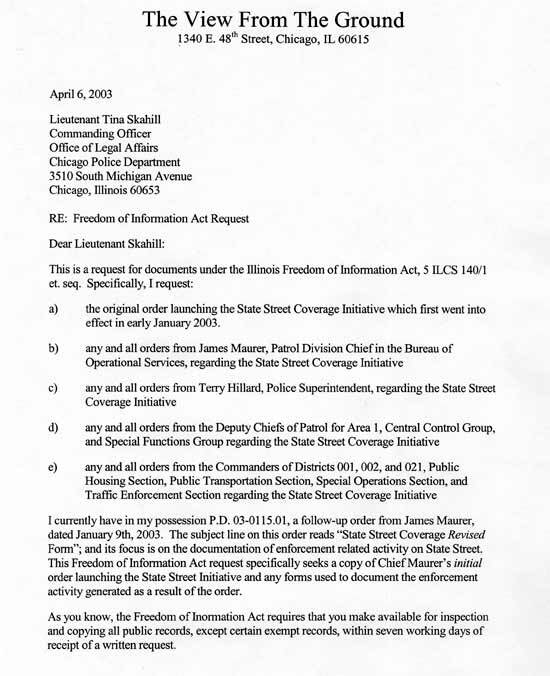 It is equally clear that the State Street Coverage Initiative was not undertaken in response to their complaints. The evidence strongly suggests that it was prompted by the complaint of one particular citizen: Mayor Daley. 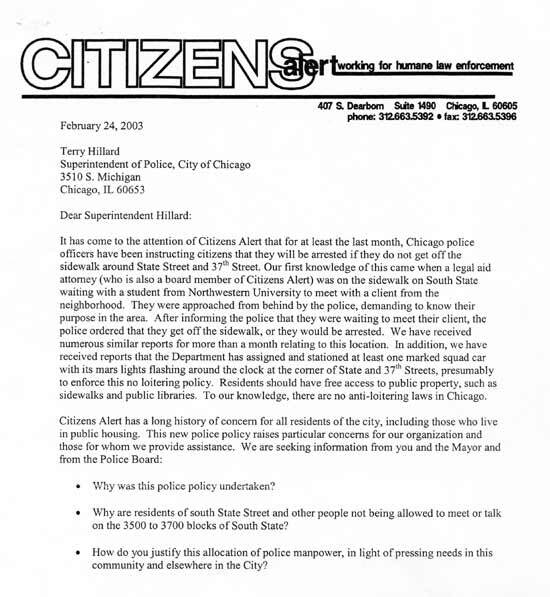 Superintendent Hillard cited “drug dealers and gangbangers along the State Street corridor” as the rationale for the heightened police presence, but in practice what distinguishes the State Street Coverage Initiative from customary patterns of policing in public housing is precisely that it was directed not at drug dealers and gang members engaged in criminal activity but at citizens engaged in non-criminal activities—walking, talking, standing—on the public street. The defining image of the Initiative, repeated countless times, is of police officers ordering citizens off the street or giving jaywalking tickets within sight of open drug dealing. Commander Perry does not explicitly mention drug dealing and gang activity as rationales, but note the language she uses: “intimidate . . . fear of being harmed . . . in fear . . . afraid of reprisals.” Are we to understand that what the Commander describes as “a perpetual state of fear” is created by jaywalking? Certain patterns—blocking the entrance to the library, selling loose cigarettes, crossing the street outside the white lines—can be seen as problems without evoking a community held hostage by fear. The rhetorical strategies adopted by Superintendent Hillard and Commander Perry in response to questions raised about the State Street Coverage Initiative make it necessary for them to portray the community in highly negative terms: it is dominated by drug dealers and gangs, community members live in “a perpetual state of fear,” and so on. Their efforts to justify a questionable police policy thus contribute to public perceptions of the community as a dangerous haven for crime. This criminalization of the community in turn facilitates the City’s program of land clearance—it lends support to the conclusion that the community is not viable and so should be obliterated rather than renewed. In this connection, it is important to recall that the State Street operation appears to have originated not in the CPD but in the Mayor’s office and to have been motivated not by concern for the safety of neighborhood residents but by the City’s development agenda. Commander Perry evokes the fears of citizens as a rationale for the State Street Coverage Initiative. Public safety is indeed a central aspiration of Stateway residents. As their community undergoes “transformation”—forced relocation, demolition, redevelopment—they have again and again called for respectful, sustained law enforcement. At the moment, however, on the evidence of scores of conversations with community members in recent weeks, it remains a place where—to use Commander Perry’s terms—conditions of intimidation, fear of being harmed and fear of reprisals arise primarily from the way the police conduct themselves in public housing. In her letter to Ms. McCullough, Commander Perry states: “The police presence is there to ensure that law-abiding citizens can safely walk the streets and make use of the resources of the Community without fear. Officers are not there to infringe upon the personal freedoms of anyone. . .” This is a welcome principle. The question is how best to implement it. Whatever else might be said about the State Street Coverage Initiative, it has been an extravagantly wasteful strategy for accomplishing these ends—wasteful of police resources and wasteful of citizens’ constitutional rights.